Also during later school years Darwin remains interested in chemistry and minerals, however he laments that “I continued to collecting minerals with much zeal, but quite unscientifically – all that I cared was a new named mineral, and I hardly attempted to classify them.” As a medicine student at Edinburgh University (1825-1827) Darwin frequented various courses on natural sciences, also lectured by mineralogist Professor Robert Jameson, however he considered Jameson´s lectures as „incredibly dull“. Nevertheless Darwin seems to have used frequently Jameson´s „Manual of Mineralogy“ for his private studies, as it is one of the most heavily annotated books in his library. Jameson´s manual uses physical properies, like color and especially the degree of hardness, introduced by German mineralogist Carl Friedrich Christian Mohs in 1822-1824, for mineral identification. 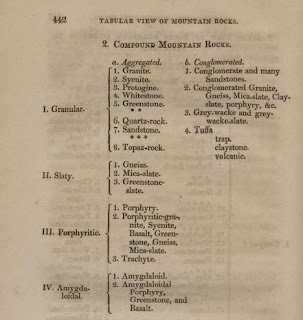 Darwin adopts this “visual characterization” approach, so he often describes rocks based on the well visible physical properties, referring to mineral texture or colors, using terms like “porphyry”, for rocks with large, well visible, crystals, "greystone" or “greenstone”, a general name for greenish-dark magmatic rocks (today classified as dolerite-basalt). When Darwin returned to Shrewsbury, August 29th, a letter from Captain Robert FitzRoy was offering him a position as gentlemen companion on board of the brig Beagle, ready to set sail from Plymouth in December 1831. On board of the Beagle Darwin could rely on a complete library for mineral identification, like "A selection of the Geological Memoirs" (1824), including a mineral chart by French geologist A. Brongniart. These manuals use properties like color, hardness, form, but also taste and odour for mineral identification. Darwin got for himself a goniometer, to measure angles of crystal-faces, a not easy to use tool in the field but Darwin proudly remarks "Hornblende determined by myself with goniometer". Especially interesting are classification charts based on the color of a specimen. 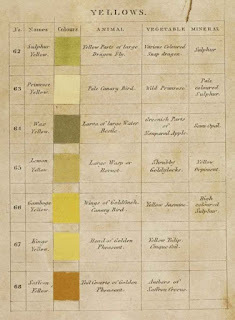 "Werner's nomenclature of colors”, published in 1821 by Patrick Syme (1774-1845), is a book displaying a chart and description of various colors to be compared with the colors of minerals, animals and plants. Darwin used this book to describe snakes, rocks and even the "beryl blue" glaciers. Fig.1. 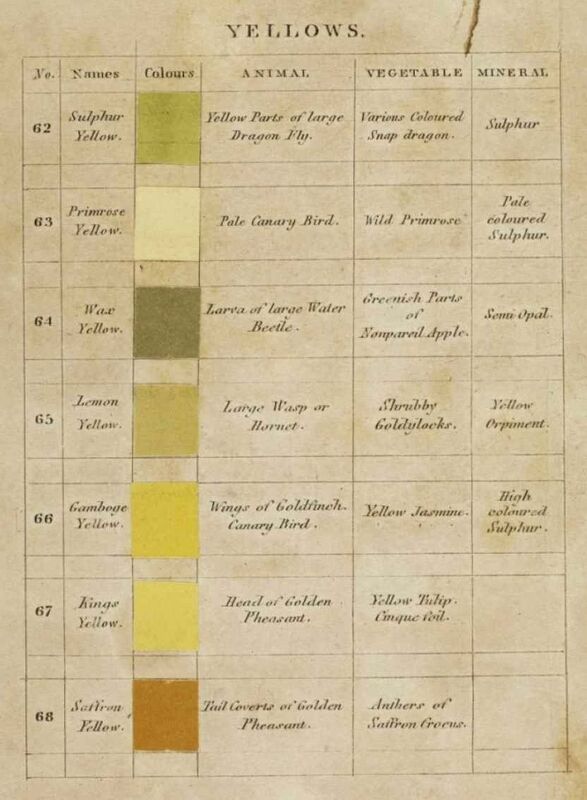 Page from "Werner's nomenclature of colors”, the book was brought on board of the Beagle by Darwin himself. It is curious to note that Darwin not only used a mineral classification scheme based on the work of German mineralogist Mohs. He adopted also the geological terms used mostly by German geologists, like Alexander von Humboldt, to describe the rocks observed in the field. Darwin will become especially interested in volcanic rocks. "Put a number on every specimen, and every fragment of a specimen; and during the very same minute let it be entered in the catalogue, so that if hereafter its locality be doubted, the collector may say in good truth, “Every specimen of mine was ticketed on the spot." Any thing which is folded up in paper, or put into a separate box, ought to have a number on the outside (with the exception perhaps of geological specimens), but more especially a duplicate number on the inside attached to the specimen itself." Fig.2. 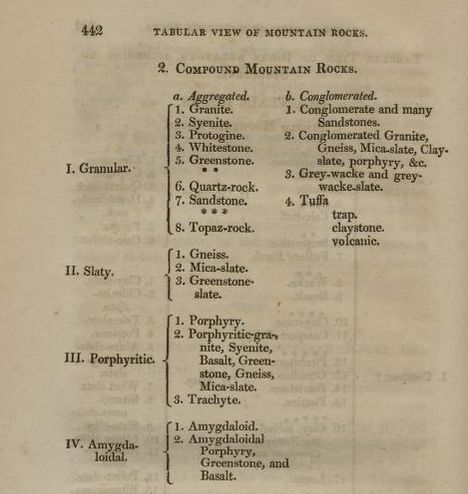 Page with rock-classification from Jameson 1821 (influenced strongly by the work of German geologists), Darwin will himself adopt "German" terms like "Amygdaloid" to describe basaltic lava flows observed on the volcanic islands visited during the voyage of the Beagle.